Metro purchased the 4,658 square metre site, located at 1 Cordelia Street, from the state government for an estimated $20 million late last year. The development, known as “New World Towers”, will include two 30-storey towers and one 10-storey tower. The development will comprise around 602 apartments - 300 one-bedroom apartments, 278 two-bedroom apartments and 24 three-bedroom apartments. The towers will hold a mix of podium level townhouses and ground-level apartments with footpath access. Bureau Proberts, these imposing residential towers will feature an wedge-shaped annex. A central recreation zone will feature a pool, cinema, BBQ area and garden. Three retail tenancies have also been planned for each corner of the site. Also included in the proposal is approximately 400 square metres of convenience retail. With an estimated project value of $291 million, the development is still in the design phase and is set for completion in late-2016. Executive Chairman of Metro Property Development David Devine said he expects the Brisbane apartment market to run hot for another four years. "We have been in the business for 30 years and we know what's going on. The uplift in demand for apartments will be with us for another four years, driven by migration," Mr Devine told the Australian Financial Review. 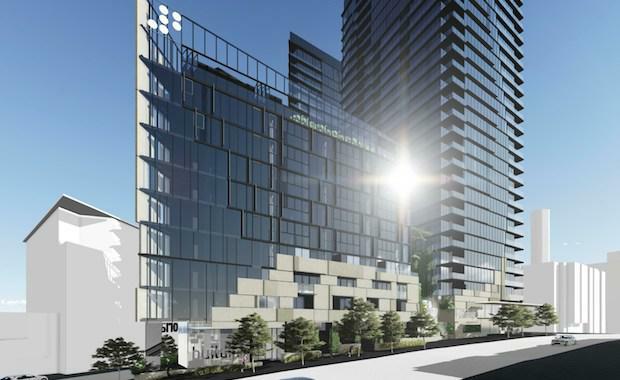 Mr Devine last month unveiled plans for a $400 million apartment development in Newstead.